Review : Well, it isn't exactly breakfast. In fact, it's just past dinner time...of which mine this fine wintery evening was Spicy Thai Stir Fried Rice from my favorite restaurant here in Reno. Yet, I've been feeling guilty about avoiding a particular tea from Culinary Teas that goes by the name of English Breakfast Tea. As such, it was time to banish my guilty and give this tea a try. If you read my review of their English Evening Tea, I actually found a straight black tea I enjoyed. As such, I didn't have the sinking feeling I normally get in my stomach when I try a straight black tea. Here is how Culinary Teas describes this tea on their website : "Good body but not overpowering with satisfying full tea flavor notes. Coppery bright - especially enticing with milk"
The leaves for this tea come from Sri Lanka, and are grown at an elevation of between 5600 and 6400 feet. As this tea is a straight black tea...there is nothing added to it. Thus...it is a "pure black tea." This black tea, once brewed, looks basically identical to other straight black teas I've had before...having a full coppery color to it. The aroma is also nothing special. It isn't that strong...and what little there is has an aroma of what you would expect from any other black tea. The flavor of this tea was about as expected...not great...not bad. I found this tea all too similar to other black teas I've tried...which means the tea has a full body flavor, leaves sort of a bitter taste in your mouth and has a unpleasant after-taste. And yes...I do brew the tea properly! Now, admittedly, this may not be the teas fault here. With a few exceptions, I've found few straight black teas I enjoy simply because the flavor is just so darn strong. About the only good news with this tea is that the flavor isn't quite as strong and overpowering as other straight black teas I've tried. Culinary Teas suggests adding milk or other things to this tea. And I agree with this assessment...as I found the flavor of this somewhat disappointing when drunk straight. Still, even with some additions to this tea...I still found it to be just your basic black tea. Overall, this tea to me is just another in the long-line of standard black teas which have a strong taste and a forgettable flavor. The tea is pleasant to drink, and I have no doubts that if you like other "straight black teas" than you'll find this tea to be far more pleasing to the tongue than I found it to be. Recommendation : Yes and no. 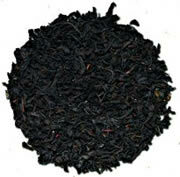 If you enjoy other traditional black teas, then you'll like or perhaps even love this tea. On the other hand, if you share my peculiar qualities and aren't a huge fan of other traditional black teas...then this tea probably isn't for you.